Life is full of yo-yoing; from mountain tops to valleys, happy times to sad times, good times to bad times, times of war and times of peace, and vice versa, but as Christians we are called to live victoriously regardless of whatever your season presents, and we are given everything we need to do so. 2Peter 1:3 "His divine power has given us everything we need for life and godliness through the knowledge of Him who called us by His own glory and excellence." 1John 5:4-5 "for everyone born of God overcomes the world. This is the victory that has overcome the world, our faith.Who is it that overcomes the world? Only the one who believes that Jesus is the Son of God. The first step to overcoming your struggles is to identify them! The Word of God concludes that subsequent to the fall and corruption of the world, Satan has been given the authority and capability to attack us externally (through the world), internally (through our flesh) and infernally (through the work of himself and his demons). All throughout the bible Satan is referred to as " the ruler of this world", "the prince of the power of the air", and “the god of this world” (John 12:31, Ephesians 2:2, 2 Corinthians 4:4) Beware! 1Peter 5:8 "Be alert and of sober mind. Your enemy the devil prowls around like a roaring lion looking for someone to devour." Galatians 5:19-21 "The acts of the flesh are obvious: sexual immorality, impurity and debauchery; idolatry and witchcraft; hatred, discord, jealousy, fits of rage, selfish ambition, dissensions, factions and envy; drunkenness, orgies, and the like. I warn you, as I did before, that those who live like this will not inherit the kingdom of God." 1John 2:16 "For everything in the world—the lust of the flesh, the lust of the eyes, and the pride of life—comes not from the Father but from the world." John 10:10 "The thief comes only to steal and kill and destroy..."
Matthew 28:18 Jesus said, “All authority in heaven and on earth on belongs to me." -Even Satan must bow submissive to our Lord's will. 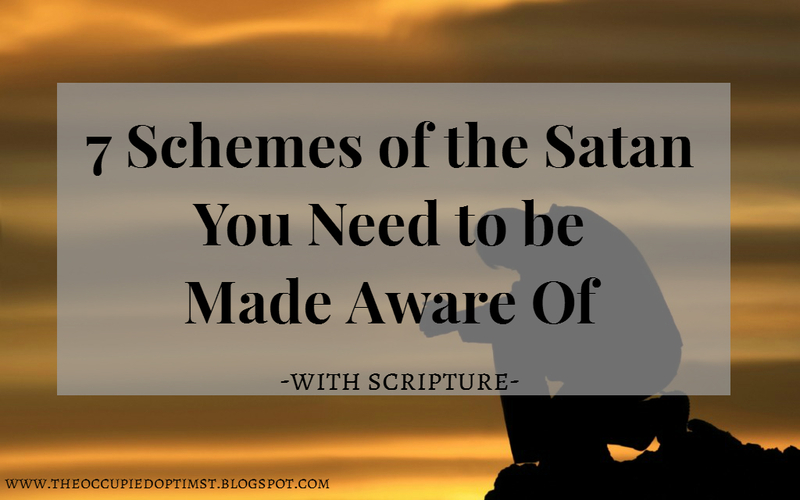 Below I have chosen to share with you just a few of the enemy's schemes in which I have been attacked with lately. I was really tempted to tack on "when you are in your 20's" to the title of this blog post. I only have 26 years worth of experience in this world but it seems to me as though these specific tactics of the enemy have hit me hard within the past couple years. Once I had highlighted these issues in my life and was able to recognize Satan, the mastermind behind it all, I was able to take heart and be better prepared to combat these spiritual attacks that plagued my soul, and I hope now you can too! ONE. The lie of loneliness. Being single doesn't help. It is amazing, cliche, sad, and true that sometimes in a big crowd of people, loneliness can seem to be my only friend. In times of discouragement and insecurity, it is easy to find myself vulnerable to believing the enemy when he taunts me with lies that I am unloved, unappreciated, and not valuable to the people around me. Sometimes this loneliness is legitimate, living out a set apart life, being 'in the world, not of the world'. Instead of drawing closer to the Lord in times like these like Jesus did, we allow Satan to use this against us. At other times, the problem procures due to the fact that I fail to value the relationships I do have with all my Christian brothers and sisters around me. I fail to see the proper function of the Body of Christ and what a blessing it can be. If you struggle with loneliness be sure to check out this outstanding article by Dr. Ken Matto HERE. TWO. Discouragement in my uniqueness. Perhaps better described as an identity crisis, if you will. I become unconfident in myself and in who I am, feeling worthless. I become unable to recognize my value and purpose in the body of Christ. I doubt the value of my own unique abilities, talents and giftings that the Lord has given me and get caught up in comparing myself with other people's abilities, talents and giftings, which is no bueno. 2 Corinthians 10:12-18 "We do not dare to classify or compare ourselves with some who commend themselves. When they measure themselves by themselves and compare themselves with themselves, they are not wise. We, however, will not boast beyond proper limits, but will confine our boasting to the sphere of service God himself has assigned to us, a sphere that also includes you. We are not going too far in our boasting, as would be the case if we had not come to you, for we did get as far as you with the gospel of Christ. Neither do we go beyond our limits by boasting of work done by others. Our hope is that, as your faith continues to grow, our sphere of activity among you will greatly expand, so that we can preach the gospel in the regions beyond you. For we do not want to boast about work already done in someone else’s territory. But, “Let the one who boasts boast in the Lord.” For it is not the one who commends himself who is approved, but the one whom the Lord commends." 1Peter 2:9 "But you are a chosen people, a royal priesthood, a holy nation, God's special possession, that you may declare the praises of him who called you out of darkness into his wonderful light." THREE. Consumed with people pleasing. In doubting my unique abilities, talents and giftings, I become overly concerned with how other people view me and if I am being accepted by them, craving their love, affection, and approval. Almost as if doing whatever I have to do to please others, is more important than pleasing God and being accepted by Him. The truth is humans are just human and it is impossible to make everyone happy. Ephesians 1:4-6 "For he chose us in him before the creation of the world to be holy and blameless in his sight. In love he predestined us for adoption to sonship through Jesus Christ, in accordance with his pleasure and will— to the praise of his glorious grace, which he has freely given us in the One he loves." FOUR. Condemnation. Satan tries to convince me that I am not good enough and condemns me for it. 2Corinthians 7:10-11 "Godly sorrow brings repentance that leads to salvation and leaves no regret, but worldly sorrow brings death. See what this godly sorrow has produced in you: what earnestness, what eagerness to clear yourselves, what indignation, what alarm, what longing, what concern, what readiness to see justice done." FIVE. Exhaustion/Sleepiness/ Physical ailments and indulging in slothfulness. Sometimes Satan plagues us physically as he did to Job, but still we must lift our eyes unto the mountains, to our Helper. And despite sadness, depression, or discouragement we must choose not to give into slothfulness. Proverbs 20:6 "Go to the ant, O sluggard; consider her ways, and be wise. Without having any chief, officer, or ruler, she prepares her bread in summer, and gathers her food in harvest. How long will you lie there, O sluggard? When will you arise from your sleep? A little sleep, a little slumber, a little folding of the hands to rest, and poverty will come upon you like a robber, and want like an armed man." Hebrews 6:10-12 "For God is not unjust so as to forget your work and the love which you have shown toward His name, in having ministered and in still ministering to the saints. And we desire that each one of you show the same diligence so as to realize the full assurance of hope until the end, so that you will not be sluggish, but imitators of those who through faith and patience inherit the promises." SIX. Being distracted and neglecting the Word. Satan tries deceiving me into believing that I have better things to do with my time rather then reading my bible. Consequently, reading the Word of God less and less will slowly cause us to drift further and further away from soundness, truth, and our Lord, which is what Satan wants. Mark 4:19 "But the worries of this world and the deceitfulness of wealth choke the word, and it becomes unfruitful." Romans 10:17 "So faith comes from hearing, and hearing through the word of Christ." SEVEN. Discouragement to change. The concept of this scheme has to do with the times when one is convicted of a certain sin or sins in one's life, and after repentance, has an inward heart change; desires to have an outward change in lifestyle and paradigm but faces adverse opposition among people around that aren't expecting the change. do you know what I mean? It seems as if people (intentionally or unintentionally) impose on you what you once were, not relenting, nor accepting or allowing you to change. This manipulation of Satan can bring about discouragement easily, perhaps simply through the form of a joke or sarcastic statement made by another individual (words have weight). Or maybe one just grows weary of the natural resistance of the world, and all the effort it takes in pursuing righteousness. Galatians 6:7-10 "Do not be deceived: God cannot be mocked. A man reaps what he sows. Whoever sows to please their flesh, from the flesh will reap destruction; whoever sows to please the Spirit, from the Spirit will reap eternal life. Let us not become weary in doing good, for at the proper time we will reap a harvest if we do not give up. 10Therefore, as we have opportunity, let us do good..."
For authoritative and empowering scripture for waging war against the enemy and fighting spiritual battles check out my blog post Waging War. Thanks for Stopping By! Did you enjoy this post!? Would you share and 'like' this on Facebook?! Can you relate to any of these things? Leave a comment below!